Account admins or owners can remotely upgrade their Zoom Rooms software to the latest version, or downgrade them to the previous Zoom Rooms version from the Zoom web portal. When upgrading or downgrading remotely, the Zoom Room will wait 30 minutes before proceeding with the upgrade, to confirm that no meetings are in progress or about to start. If you need to do a faster upgrade to the latest version of Zoom, you can download and install the latest version of Zoom Rooms from the Download Center. Login to your Zoom web portal and navigate to Zoom Rooms. Click on the name of the Zoom Room you would like to upgrade. The App Version will list that it is being upgraded. If you need to cancel the upgrade before it is completed, click Cancel. Note: The Zoom Room will wait 30 minutes before proceeding with the upgrade, to confirm that no meetings are in progress or about to start. 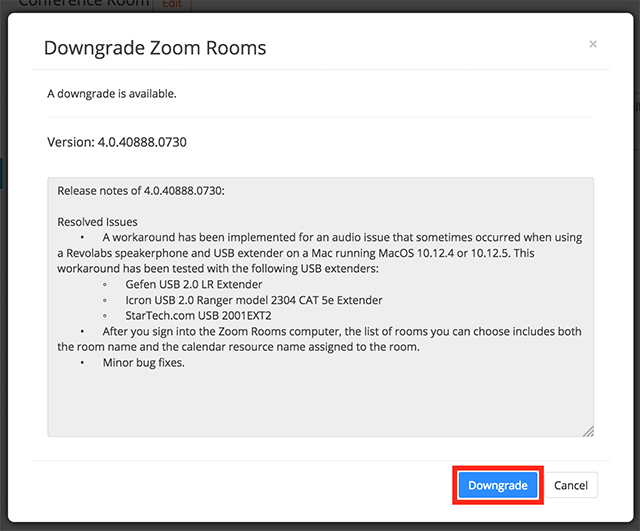 If you need to upgrade faster, you can download and install the latest version of Zoom Rooms from the Download Center. 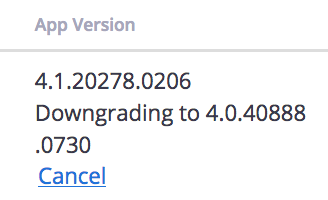 Click Downgrade next to the version number. Confirm that you would like to downgrade. The version will list that it is in the process of being downgraded. Click Cancel to stop the downgrade if needed. Note: The Zoom Room will wait 30 minutes before proceeding with the downgrade, to confirm that no meetings are in progress or about to start.